Tijuana, Mexico – Bekeni Christain Tabasangh was one of dozens of people seeking the shade at the edge of a Tijuana plaza near the foot of the pedestrian bridge crossing into San Diego about a week ago. Weeks earlier, he signed up on the list that included the names people waiting in Mexico to request asylum in the United States. Tabsangh, 33, left Cameroon in August, fleeing violence in the country’s Anglophone regions. Government forces are battling an armed Anglophone separatist movement in southern Cameroon, including where Tabasangh is from, in the Fako Division. Civilians are also being targeted. The conflict has killed more than 400 people since last year and forced thousands more to flee, according to rights group and the United Nations. “I escaped Cameroon because they were looking for youths, killing youths all over,” said Tabasangh told Al Jazeera. “When they see you, they will say that we are terrorists. Likewise, the terrorists that are fighting with them, they are somewhere, hiding, so when [government security forces] run into you on the street they will not even ask if you are one of them or not, they will just kill you,” he said. The government, police and separatists often give conflicting accounts of who is responsible for the killings, but Tabasangh said police broke down the door of his younger brother’s home and shot him dead. “People are dying every day for no good reason. They don’t want the media to expose it,” Tabasangh said. 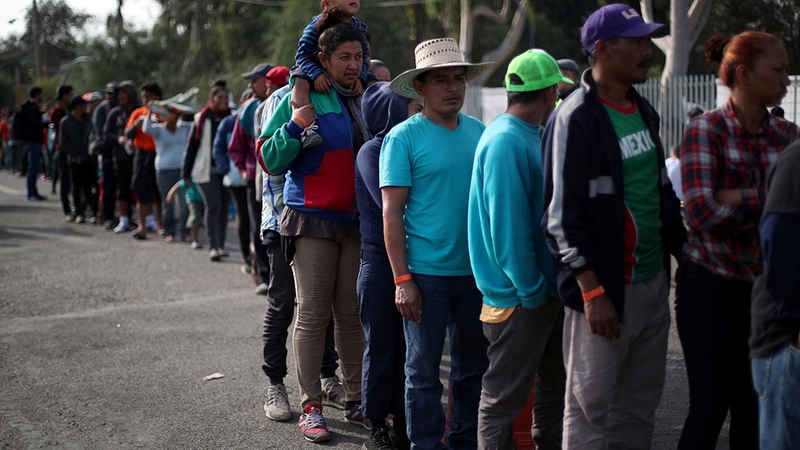 Tabsangh’s wait to enter the US came as thousands of Central Americans, part of a mass exodus, trickled into Tijuana area to sign up on the waiting list to seek asylum in the US. 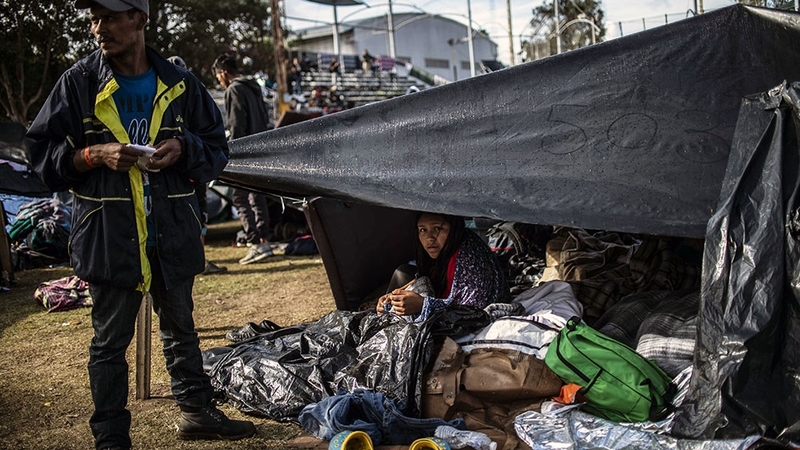 Many told Al Jazeera they are fleeing violence, poverty or political persecution. The first of the highly visible groups, originally dubbed caravans and now a self-denominated exodus, left Honduras last month. 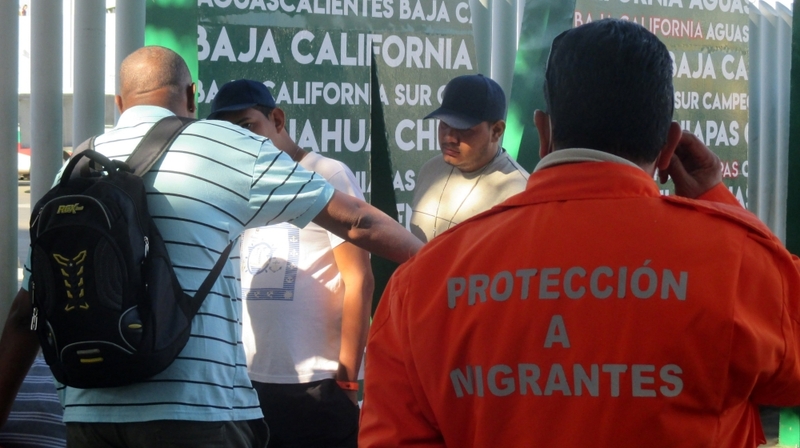 More than 5,000 migrants and refugees are now in Tijuana, and most of them are staying in a local stadium complex that is more than 2,000 people over capacity. Subsequent waves of the exodus, largely from Honduras and El Salvador, are making their way up through Mexico. US President Donald Trump has referred to the exodus as an “invasion”, which has no basis in reality, migrant and human rights organisations say. Furthermore, the US is intentionally creating bottlenecks and long wait times for asylum seekers for no good reason other than to attempt to dissuade people from seeking asylum, according to advocates. 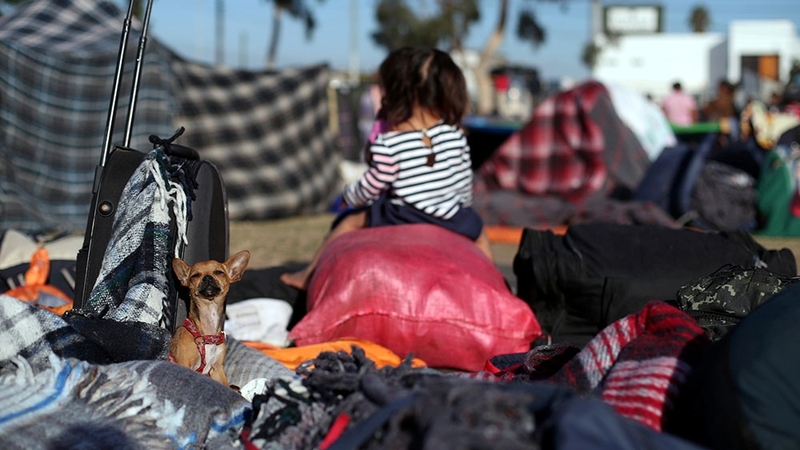 “The US government’s refusal to prepare to receive refugees, which it knew about for some time, has created a humanitarian crisis in Tijuana and other Mexican border cities,” Al Otro Lado border rights project director Nicole Ramos said in a statement this week. “It is inconceivable that a government, one arguably among the most powerful and wealthiest in the world, chose to install barbed wire and soldiers in place of developing strategies and spaces to process refugees expeditiously, and with the human dignity that all human beings deserve,” she said. Lado’s comments have been echoed by other rights groups at the border. The number of individuals who are able to cross into the US to request asylum varies widely from day to day. US Customs and Border Patrol (CBP) strongly disagrees with any assertions that border officials are intentionally creating backlogs and bottlenecks at ports of entry to dissuade or deter people from seeking asylum. “CBP processes undocumented persons as expeditiously as possible without negating the agency’s overall mission, or compromising the safety of individuals within our custody,” a CBP spokesperson wrote in an email to Al Jazeera. “Depending upon port circumstances at the time of arrival, individuals presenting without documents may need to wait in Mexico as CBP officers work to process those already within our facilities,” the spokesperson said. Meanwhile, the US government continues to ramp up measures in response to the Central American exodus. Trump has deployed thousands of active duty troops to border areas and given the military more authority, including for the use of lethal force. On Thursday, Trump once again threatened to shut down the border with Mexico, alleging the situation could get out of control. Trump’s renewed threat will not likely affect Tabasangh, though. After four and a half weeks of waiting, his number was nearly up. He will take almost no belongings with him. It was a long journey across three continents, including more than 7,500km up through Latin America alone, and almost everything he had brought with him from home was stolen. When he first left on August 19, he travelled across West Africa to get to Ghana where he flew to Istanbul and then to Colombia. Once arriving in South America, he bussed, boated and trekked from one border and immigration checkpoint to the next. Due to tightened restrictions in Nicaragua, Tabsangh had to trek through dangerous forest routes to avoid checkpoints and border authorities. “I was robbed terribly. They take my passport, take money from me, take my hand luggage, all my shoes, everything,” he said. He eventually made it to Mexico, where after spending a week in detention was given a transit permit, one of the only documents Tabsangh carries with him. Dated October 19, it granted him two weeks to leave the country because until not all that long ago, that is how long it would take to cross all of Mexico and request asylum in the US. When Tabasangh finally crosses the bridge from Tijuana over into the US, his permit will have been expired for more than two and a half weeks. For those still arriving, the wait could be several months, and some migrants and refugees are starting to become frustrated. A group of roughly 100 people walked towards the San Ysidro port of entry on Thursday in an attempt to pressure for a solution. Hundreds decided to camp out sleeping in the area Thursday night for the same purpose. Near the foot of the pedestrian bridge over into the US, the sun began to rise Friday over migrants and refugees in the plaza, huddled under blankets for warmth. Others who had arrived before the Central American exodus soon showed up to check if their number was going to be called.